And the bids are in! Three development teams have officially pitched their ideas on the future of Parcel 13 to MassDot and the MBTA, and now sit patiently awaiting the results. Once chosen, the proposal winners will be granted 54,500 square feet of air rights over the Mass. Pike and Green Line tunnel, which is quite a wide range of space according to Boston standards. Parcel 13 is located in Back Bay on Boylston Street and Mass. Ave. – prime location; however, it is shortened by the MBTA station and divided by the Massachusetts Turnpike. But that hunch doesn’t inconvenience these innovative developers. Ideas range from multi-use buildings – residential and retail space – to hotel and community spaces. A winner will be chosen by the end of the year and then the construction begins! 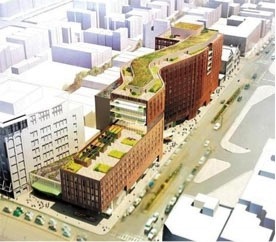 Curbed Boston has more information on the three pitches received. Continue to check back in the coming weeks and months – further updates on Parcel 13 are on the way!